Since Slavic times Jewish families lived in Brandenburg. In the Middles Ages they inhabited Alt- and Mittelmark in large numbers. They belonged to the first residents in the flourishing double-city Berlin-Cölln in the 13th century - and in Frankfurt Oder there was already a synagogue in 1300. At the same time the dependency on the mercy of the Christian souvereigns grew. Little by little they were driven out of many occupations, because access to guilts were denied to them. Thus they worked mainly in the credit sector, retail as well as slaughteres which was directly related to the needs of Jewish life. Elector Friedrich I, with whom the rule of the Hohenzollern over Brandenburg started, confirmed the privileges of his Jewish subjects and made them equal to the Christians in jurisdiction. However, his successor Friedrich II expeled all Jews out of the country in 1446. They were able to return in the following year - in exchange for high payments and with restricted rights, like the prohibition of owning land. This was a repeating pattern of souvereign's tolerance and persection that peaked in the statewide expulsion of Brandenburg Jews in 1510 as a result of the Berlin 'host desecration' process. Often, the expelees migrated to the neighbouring and much tolerant Poland. More than 30 years later, the elector Joachim II granted them the return to their old homeland - again in exchange for high payments. Jewish life returned to Brandenburg, but just for a short period of time. Fear of the unknown, prejudices, and the widespread assumption of the Jews as the murder of Jesus Christ as well as economic interests were the main reasons for persecution and expulsion not only in the Middle Ages. Even though the elector protected the Jewish immigrants, he prohibited them the participation in the Frankfurt fair in 1543, probably because of a letter by Martin Luther. Later, they were allowed to participate again, but banned from living in Frankfurt for a short period of time. One of the returnees, Lippold ben Cluchhim was quite succesful at the elector's court. Joachim II appointed him treasurer and court Jew, principal of all Brandenburg Jews and finally master of the mint. He was thus responsible to acquire money for the enormous massive needs of the court. After the death of the elector in 1571 this became fatal for him: Accussed with embezzlement he was found innocent. Being threatened with torture, Lippold ben Chluchhim admitted to sorcery and poison murders. His process and conviction to being divided into four parts, and beheading was the beginning of a new countrywide persecution of Jewish families. The Christian neighbours looted their houses andburned bonds. In 1573, all Jews had to leave Brandenburg again and were not allowed to even take movable possessions. Only one century later, in 1671, elector Friedrich Wilhelm received Jewish refugees from Austria in Brandenburg. 50 families came. This was the start of new Jewish life in the country which only found its horrible ending in the holocaust in the 20th century. Irrespective of the expeled Jews a few years earlier, Frankfurt Oder developed into center of Hebrew language studies. This also was reflected in Hebrew printing. 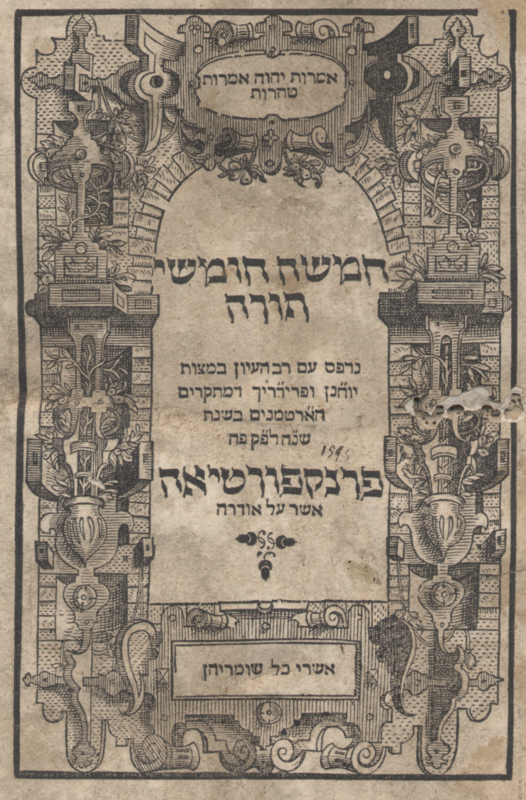 The publisher Hans Hartmann and his son succeeded to print a Hebrew bible until 1596. Polish Jews were allowed to trade at the Frankfurt fair even after 1571. This led to contacts between academic and Jewish worlds. Besides the influence on scientific studies, the Hebrew bible print also meant economic success. The Jews who lived in neighbouring Poland liked to buy the works printed in Frankfurt.